The Bindhyabasini Temple or Bindhya Basini Temple looks like a small white hut, however there are other temples scattered inside the boundary. Situated on a small hillock with a beautiful view of the massive Annapurna ranges. 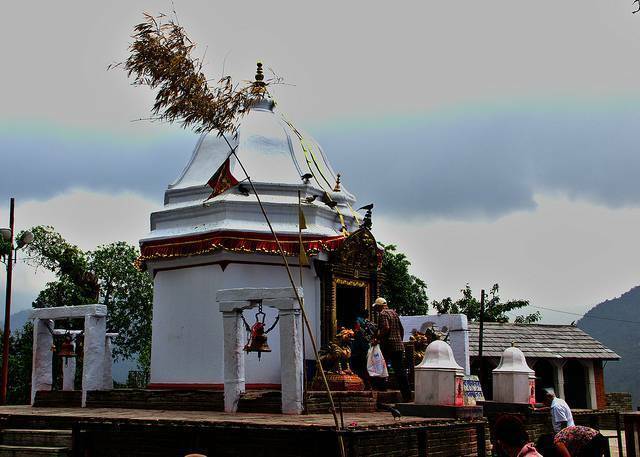 The Bindhya Basini temple is dedicated to the goddess Bhagwati, known as the guardian deity of Pokhara. Known as the blood-thirsty goddess there have been sacrifices of animals made to please the goddess, which accounts for some gruesome sights for an average non-violent person. The temple is 3000ft above sea level and as mentioned earlier sits on a hillock therefore devotees have a flight of stairs to climb from the road till the temple. The slope right beside the temple has a couple of café’s and shops where you can find souvenirs of the temple and offerings to be made inside the temple. This beautifully located temple holds quite an importance for the Hindu’s in the area, hence some code of conduct is to be followed while entering the temple. Its best recommended if a spiritual time is what you are looking for.